Not all 3D printing is meant to last. When CalArts student Aaron Bothman decided to print something for his short film The Red Witch, his thesis project, he wanted it to be less permanent. 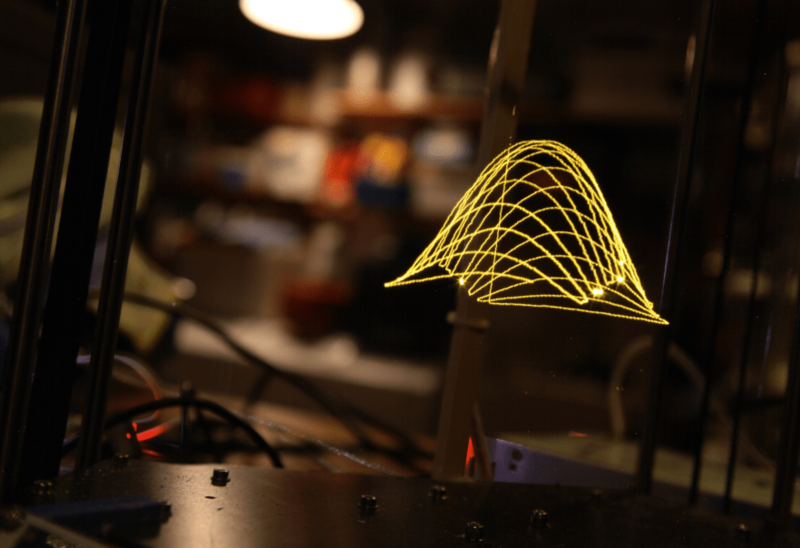 Having seen the work of Beijing-based artist Ekaggrat Singh Kalsi, who has used a modified 3D printer to ‘print’ in light, he found his inspiration. Not something that you can pick up with your hands, the product of this technique is something that can be captured on film, which is exactly the medium in which Bothman works. He and his father worked together on building the printer, a small delta model constructed from a kit but with a particular twist. When assembled, an LED was placed where the hot end would usually have been installed. This allows Bothman to capture the light on film by using a long exposure while the printer runs the model, tracing out the shapes as a 3D light painting. In order to create the light animation, each Maya image to be captured is sent to the printer one frame at a time. Over time, these images create the illusion of movement, just as is done in more traditional stop motion filming. The result is a piece that is built up in layers, requiring the same mode of conceptualization as a 3D printing project but with the option for movement and, of course, no support materials. In fact, no materials at all, something that makes this a particularly appealing way to engage in a 3D printed project if there is no need for the product to be tangible. Somewhat akin to the old question about a tree falling in the forest with no one to hear it, the question that could be asked of this technique could be: when a 3D printer creates something that cannot be touched, is it still 3D printing? The creations don’t truly occupy space or at least they only do for a fleeting moment but as they dance before your eyes, I think you may be willing to set that debate aside for a moment. Just think of it this way: with this technique, you could print all you want and never run up a bill for filament and never have to worry about storage space. And that sounds pretty ideal to me. 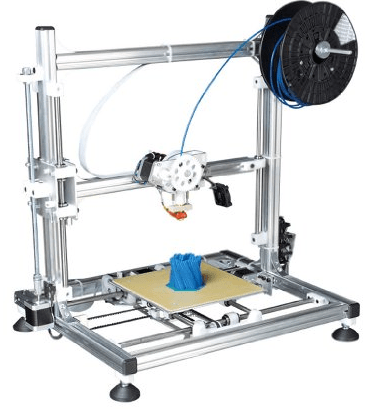 Let us know what you think about this concept in the 3D Printing with Light forum thread at 3DPB.com. 3D printing production is just scratching the surface of the multi-trillion dollar global manufacturing industry. But its dominance is already pre-determined. This is because modern manufacturing, despite numerous technological and process advances over the last century, is still a very inefficient global system. Today’s world of mass production is based on one simple rule: the more things you make, the lower the cost of each of those things. We have literally pushed this equation to its extreme limits. This approach was dramatically accelerated by Henry Ford, arguably the most impactful character in the industrial revolution. For starters, Ford proved out the model of mass production. He wasn’t the first to create the assembly line, but he was the first of his time to perfect it. He built massive factories, and greatly standardized his product and processes. He once famously stated, “Any customer can have a car painted any color that he wants, so long as it is black.” The quote may be familiar, but do you know why only black? It wasn’t due to Ford’s forward-thinking design sense, but rather because black was the only color that could dry fast enough to keep up with his assembly lines. By 1915 he had reduced the time it took to build an automobile by 90%. By 1916, an astounding 55% of the automobiles on the road in America were Model Ts. 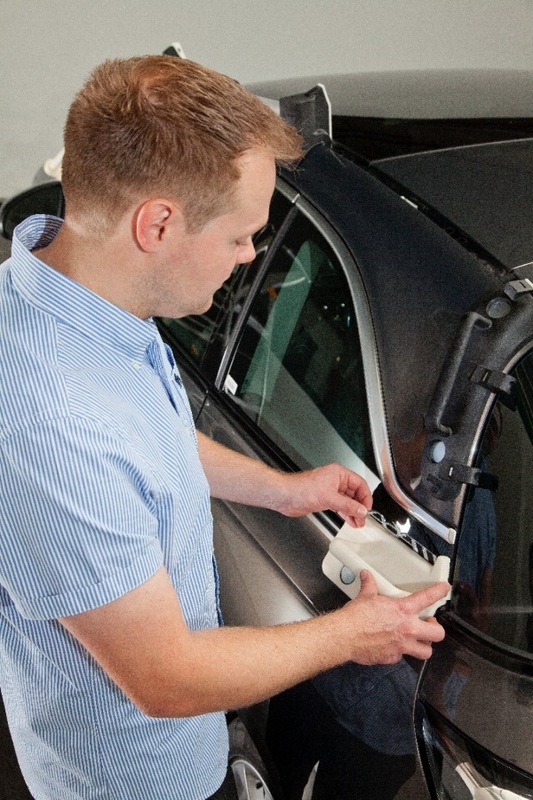 Ford mastered mass production and created the world’s first mass consumer product. But there is another reason why Ford is such an important figure historically. Henry Ford literally punctuated the industrial revolution. We have all been taught about the industrial revolution as if it were a binary switch. There was a before and an after. We all believe we live safely in the after. This IS the future. But what if that’s wrong? What if mass production is not the end of this story, but rather just a stop along the way to something completely different? What if a technology came along that could turn everything upside down all over again? 3D printing is a technology that allows you to create things differently, from the ground up, layer by layer until you have a fully formed 3 dimensional object. Just like you now send a computer file of a document to a printer in your home or office, you can now send a computer file of an object to a 3D printer, and out comes that physical object. Eventually, you will be able to print almost anything you can imagine. The fully-body Iron Man suit! 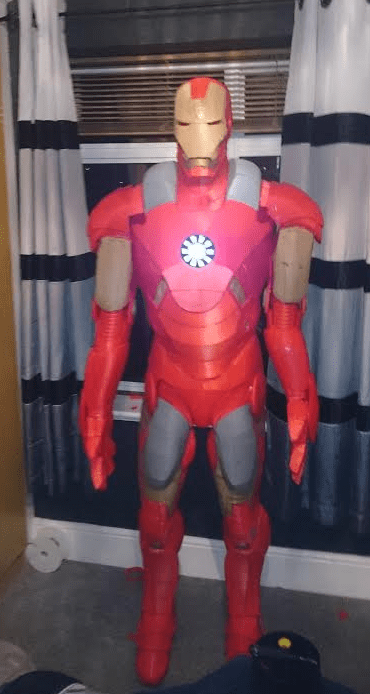 An Incredible 1.8 Miles of Filament Were Used to Create This Fully-Body Iron Man Suit! One of the areas which has seen substantial benefit from 3D printing is that of the prop and costume industry. Whether created for movie and set production or printed out as simply a hobby, the design attributes that 3D printing has to offer are taking prop and costume making to the next level. Over the last 13 months we have seen numerous body suits and masks from popular movies 3D printed. We’ve seen entire 3D Printed Alien Xenomorph suitscreated, as well as life-sized suits such as the Hulkbuster from the Iron Man movies 3D printed and then painted. 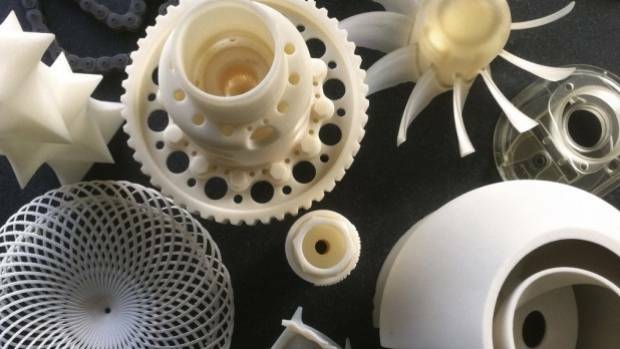 Additive manufacturing enables fine intricate details which could not have been accomplished without great expense using traditional forms of subtractive manufacturing. 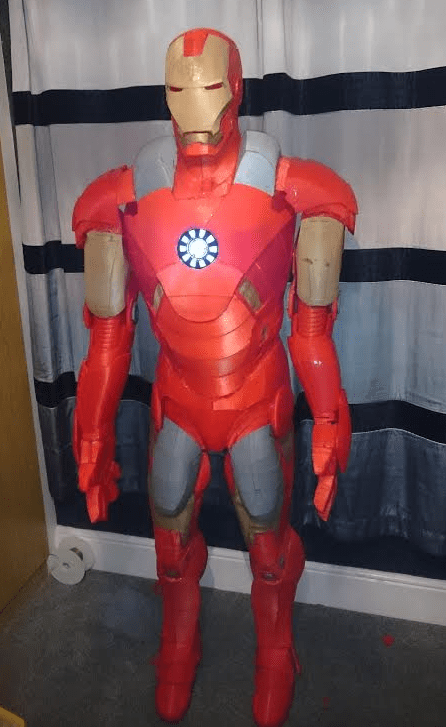 In what may be one of the most detailed and largest prop/costume projects we have seen to date, a 20-year-old Marvel Comics enthusiast named Ross Wilkes has created a 3D printed life-sized Iron Man suit. The project — which Wilkes started way back in 2013 as part of his odd, yet very creative, New Year’s resolution — has taken 14 months to finally culminate in a complete suit reminiscent of Tony Stark’s famous armor. ‘Incredible’ may be an understatement. Wilkes, who used only one 3D printer, a Velleman K8200, which was purchased in kit form back in 2013 and assembled soon thereafter, used quite a bit of filament for this project. A total of 32 1kg-spools of filament were used, equating to approximately a 1.8-mile-long strand. Because the Velleman 8200 has a build envelope of just 20 x 20 x 20 cm, Wilkes had to 3D print the suit in hundreds of separate pieces before fusing them all together, sort of like a puzzle. Three different colors of filament were used for the main body of the suit — red, gold, and gray — and it even features the familiar chest repulsor transmitter, centered at the sternum area. Unlike many past projects we have seen, Wilkes did not paint or use any finishing techniques on this project, relying on the colors of the filament to do their job. As you can see from the images provided to us by Wilkes, he’s done a remarkable job at realizing an accurate rendition of the suit, one which appears to be 3D printed, yet still remains a very accurate representation of the suit we are all familiar with from comic books and movies. 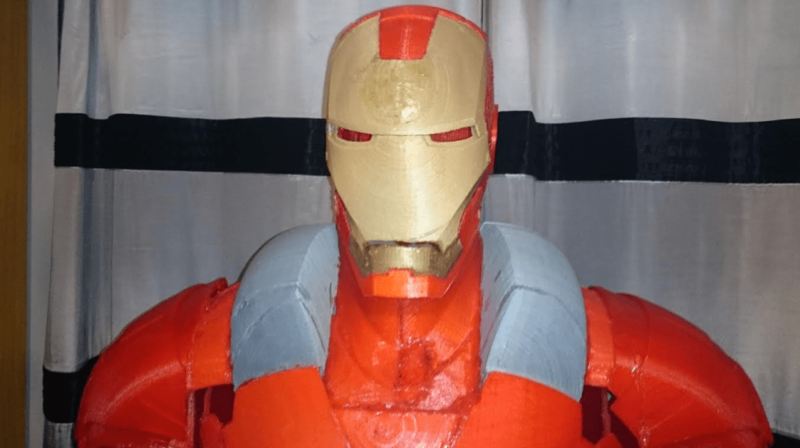 Let’s hear your thoughts on this incredible 3D print in the 3D printed Iron Man Suit forum thread on 3DPB.com.